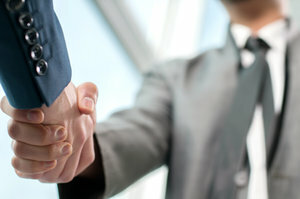 Host your next business conference in our meeting room in Arlington, TX! The Lone Star Room is the ideal place to host your next power meeting or team celebration. With space to host up to 45 guests, our meeting room comes equipped with complimentary Wi-Fi as well as access to copy and fax machines for any of your hard copy needs. 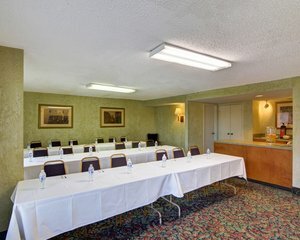 Host a conference in the Lone Star Room, or use it as a gathering point for group trips to the area. 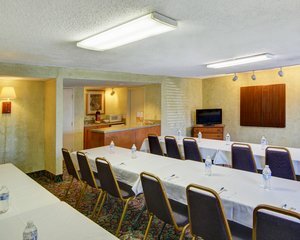 Book our affordable meeting room by contacting the hotel directly at 817 467-3535. Room Info: 432 square feet or 24 feet. x 18 feet. Enhance your presentation with the assistance of our desktop computer. We can supply additional notepads, pens, and large easel pads so your team can brainstorm and collaborate freely. Attached to the Lone Star meeting room is a small kitchenette, complete with a microwave, mini-refrigerator, and countertops for catering. Refresh your guests with food and beverages throughout your meeting. Our staff is happy to assist. After a busy conference or meeting, guests can relax in one of our hotel’s charming guest rooms! 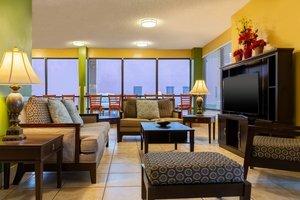 Each room comes equipped with everything you need to stay productive throughout your stay, including high-speed Wi-Fi, a dedicated work station, and a comfortable king bed. Commute to your morning meeting at local offices and job sites, listed in the map below. Call the hotel directly to send in a request to book our affordable meeting room in Arlington, TX today!